While Milcho Manchevski’s greatest claim to international fame might be as the director of the first Macedonian film nominated for the best foreign language Academy Award, he probably deserves far more credit for inspiring a host of films that in various ways fracture linear narrative. Told in a triptych which forms a circular narrative, Manchevski’s Before the Rain (trailer here), made its European festival debut weeks ahead of Pulp Fiction, yet it would be Tarantino’s film that would be credited (or blamed) for a parade of non-linear imitators. In advance of the January 30th New York opening of Manchevski’s latest film, Shadows, the director’s first two films closed the Macedonian Film Festival Sunday night. Rain begins and ends in Macedonian, but its middle story is set in London. The film was in fact a British-Macedonian co-production, at a time when the British government did not recognize that of Macedonia. As befits its title, a storm is always approaching in Rains, both the meteorological and human varieties. In “Words,” the first chapter, Kiril, a young monk who has taken a vow of silence, gives shelter to Zamira, a young Albanian girl running from a lynch mob. After his act of sanctuary results in his own expulsion from the monastery, Kiril mentions an uncle in London might be able to help them, and that is indeed where Manchevski shifts the action with “Faces.” The Pulitzer Prize winning photo-journalist Aleksandar Kirkov is returning to the city after an assignment in Bosnia that profoundly disturbed him. After resigning, he tells his photo-editor and illicit lover he is returning to Macedonian, with or without her. She declines to leave despite her dubious feelings for her husband. However, the violence she had only experienced vicariously through Kirkov’s lens erupts into her own world when a Serbian rivalry turns violent in a posh London restaurant. The longest segment, “Pictures,” tells the story of Kirkov’s problematic homecoming. As he approaches his native village, he disarms a petulant teenager standing guard with a machine gun. At times Kirkov resembles Eastwood’s Man with No Name, except instead of a former gunslinger, Kirkov is a retired photographer. However, we eventually learn that his camera has actually killed people. Although more familiar to American audiences for sinister roles on Fox’s 24 and in films like Eyes Wide Shut and The Saint, Rade Šerbedžija gives one of the best screen performances of the 1990’s as Kirkov, the celebrated observer forced to chose sides and participate. Clearly, the spaghetti westerns were a pronounced influence on Manchevski, because he would incorporate the genre into his second film, Dust. Told in flashback by Angela, an elderly woman, to her would-be robber “Edge,” Manchevski weaves a Munchausen-esque fable about Cain and Abel brothers who start in the Old West, but travel to the wild East of Macedonia, as it revolts against the Ottoman Empire. Again, Manchevski plays narrative games, but the intrusion of elements from disparate time periods is often distractingly played for comedic effect. The strongest scenes of the film are actually the least mythical. Rosemary Murphy and Adrian Lester convincingly sell the unlikely relationship between Edge and Angela. Unfortunately, neither brother is particularly interesting. Joseph Fiennes’s Elijah is a caricature of religious zealotry, while David Wenham is somewhat more nuanced as Luke, who is incapable of true emotional engagement, except when killing people. 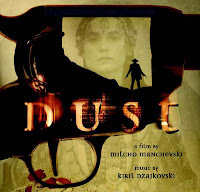 Dust is a big, ambitious film that ultimately got away from Manchevski. Rains however, is a contemporary masterpiece that reveals increasingly greater depths with each viewing. In Rains, characters fantastically reappear in various times and places to further challenge the overall narrative thr ead. Yet, Manchevski’s execution is subtle, never directly interfering with the events on-screen. Ultimately, the cycle of violence continues, as the story doubles back, forming a complete circuit. Evidently, Sergio Leone was not his only influence. During last night’s Q&A, Manchevski explained the first part of the film’s repeated mantra: “Time never dies, the circle is not round” was in fact inspired by Chick Corea’s Mad Hatter album. Given his international success, the Manchevski double-feature made a fitting closing night for the Macedonian Film Festival. Rains is a member of several exclusive cinematic clubs: the Venice Film Festival’s Golden Lion, the New York Times’ “Best 1,000 Films Ever Made,” and a Criterion Collection DVD treatment. Though flawed, Dust is still fascinating filmmaking, worth seeing simply to compare with future Manchevski films, like the forthcoming Shadows.